The data was added on ,	1 October 2017 read 571 times. 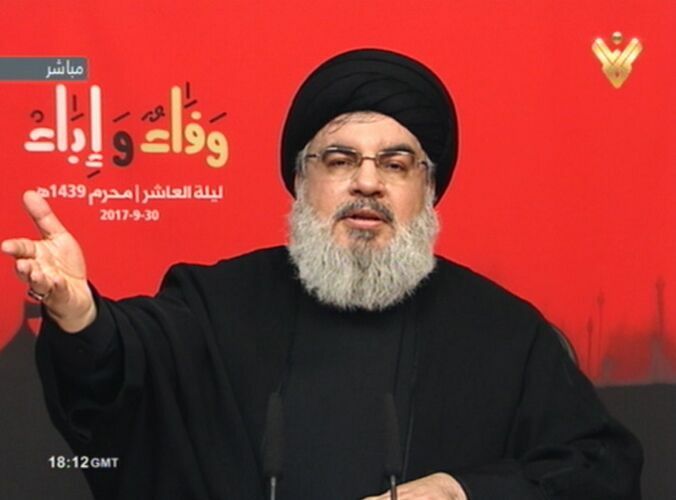 Hezbollah Secretary General Sayyed Hasan Nasrallah said that the resistance won’t withdraw from battlefields against the Ummah’s enemies, stressing that the resonant call of “At Your Service O Imam Hussein” will last. During Hezbollah central Ashura ceremony on the tenth eve of the Hijri Month of Muharram in Beirut’s southern suburb, Sayyed Nasrallah warned against secession bid by Kurdistan region in Iraq, saying the move threatens the entire region. Sayyed Nasrallah said following the defeat of ISIL Takfiri group, the region is before a dangerous scheme of division starting from secession bid by Kurdistan. His eminence warned that the US administration is plotting for new enmity in the region. In this context, Sayyed Nasrallah warned Saudi Arabia against schemes aimed at inciting local confrontation in Lebanon. Talking about local issues in Lebanon, Sayyed Nasrallah stressed that the parliamentary elections are to take place on time (May 2018) based on the agreed electoral law. Hezbollah S.G. meanwhile warned that the issue of Israeli spying devices should be politically solved, or else Hezbollah will deal with this dangerous threat. On the other hand, Sayyed Nasrallah called on Syrian refugees to return to their country and take part in reconstruction of Syria. Sayyed Nasrallah started his speech thanking the resistance crowds for their mass attendance in Ashura ceremonies commemorating martyrdom of Imam Hussein (a.s.) since the start of Muharram Hijri month across Lebanon and especially in Dahiyeh. Sayyed Nasrallah said whatever the disputes were; the Lebanese parties can find solutions through dialogue, referring to latest issues of wage scale and electoral law. “We’ve heard that there have been preparations for new alliances in Lebanon. If that is related to elections, we have no problem,” Sayyed Nasrallah said, warning against preparations for local confrontation in Lebanon. His eminence warned local sides in Lebanon against being engaged in such confrontations, stressing that such call was not out of weakness but based on Hezbollah’s keenness to preserve stability in Lebanon and the region. Sayyed Nasrallah ruled out any extension of the Lebanese Parliament term. Touching upon security in Lebanon, Sayyed Nasrallah first hailed the achievement of liberating Lebanon’s eastern mountain range. He warned that the security threat still exists but in lower level. On the other hand, Hezbollah S.G. lashed out at foreign embassies over their warnings of security risk in Lebanon. “The logistic base of terror is over now, and the ability to carry out terrorist attack in Lebanon has been limited. Despite absurd warnings by some embassies, we have to say that Lebanon is one of the most secure countries across the world. Lebanon is more secure than Washington itself,” said Sayyed Nasrallah. Sayyed Nasrallah also reiterated call to Lebanese people to refrain from celebratory gunfire, stressing that such behavior is forbidden in Islam because it causes harm. Hezbollah S.G. on the other hand, called upon Syrian refugees to return to Syria and take part in the reconstruction of their country. His eminence stressed that the interest of the refugees lies in going back to Syria. Sayyed Nasrallah said that all guarantees regarding this issue could be offered, calling upon Lebanese parties to deal with the Syrian refugees problem based on national interest rather than narrow interests. His eminence also slammed the stance of some Lebanese parties which have been refusing coordination between Lebanon and Syria, stressing that the Syrian refugees issue cannot be tackled without such coordination. Sayyed Nasrallah meanwhile, threatened that Hezbollah won’t keep mum on the latest Israeli violations represented by spying devices planted across Lebanese territories. Turning into regional issues, Sayyed Nasrallah stressed that the region witnesses now ISIL’s defeat, noting that the terrorist group’s end is just a matter of time. Sayyed Nasrallah described the latest ISIL attack on Syrian army and Hezbollah in Badiya as normal reaction to the Takfiri organization’s defeat, noting that the attack aimed at exhausting the allied forces of the axis of resistance. Following the defeat of ISIL, the region is before a dangerous scheme of division, Sayyed Nasrallah said, warning that such scheme is represented in the secession of Kurdistan region in Iraq. His eminence also called on people of the region to refrain from resorting to ethnic bias. Sayyed Nasrallah in this context warned that wars in the region are in favor of ‘Israel’ and US along with the latter’s arms companies. Sayyed Nasrallah concluded his speech stressing that the resistance won’t abandon its duties in defending the right and confronting the Ummah’s enemies, saying that Hezbollah will not withdraw from battlefields.